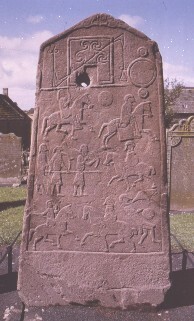 General view of the back of the slab, showing at the top of the slab a pair of beast heads face each other baring their teeth. There are two panels. 1. At the top left there is a rectangular shape decorated with spirals and on the right a triple-circular disk. 2. A battle scene with three rows of figures, five on horseback, four on foot.